Hello friends! Giovana here today bringing you a cute card, haven't made for eP in awhile, so I decided to make an elegant and simple one for you. 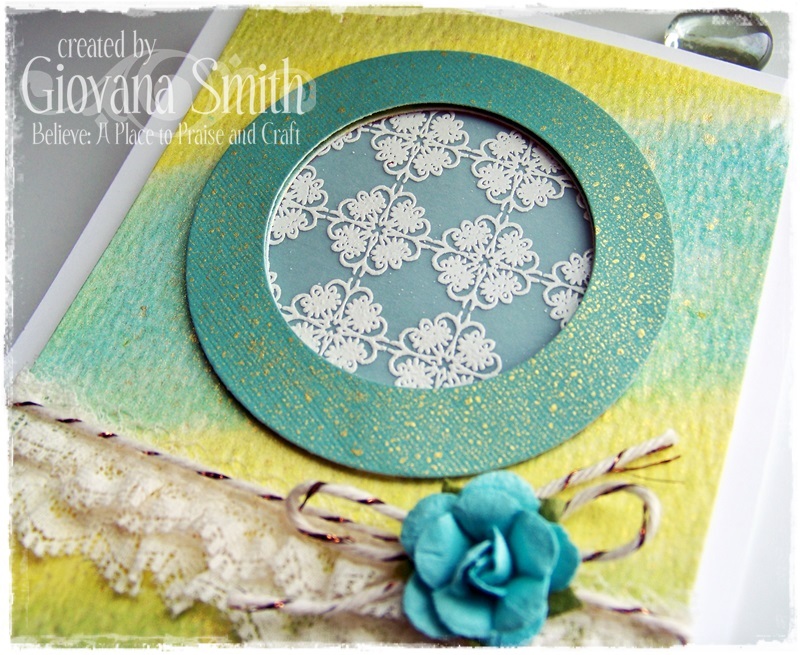 Make your card base from White Cardstock. This one is A2 size. Take a piece of Tim Holtz Watercolor paper, mist your cardstock. Add bit of Distress Inks to a acrylic block or sheet, I used Mustard Seed, Peeled Paint, Broken China and Tumbled Glass. Spray acrylic block and add the ink to your cardstock with a water brush. After your watercolor piece dried, cut out panel to 3.75" x 5", then cut the bottom part. Stamp Fancy Florals background image on Vellum cardstock in Versamark ink, then add White Embossing powder and heat set. Die-cut a circle to you watercolor piece, cut a piece of the vellum piece and adhere it behind it. Add the circle from the watercolor panel behind the vellum. 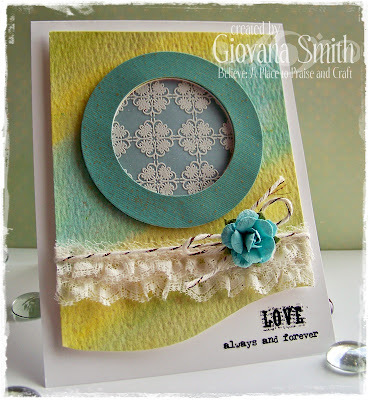 Create a circle window from Blue cardstock and adhere it to panel with dimensionals. 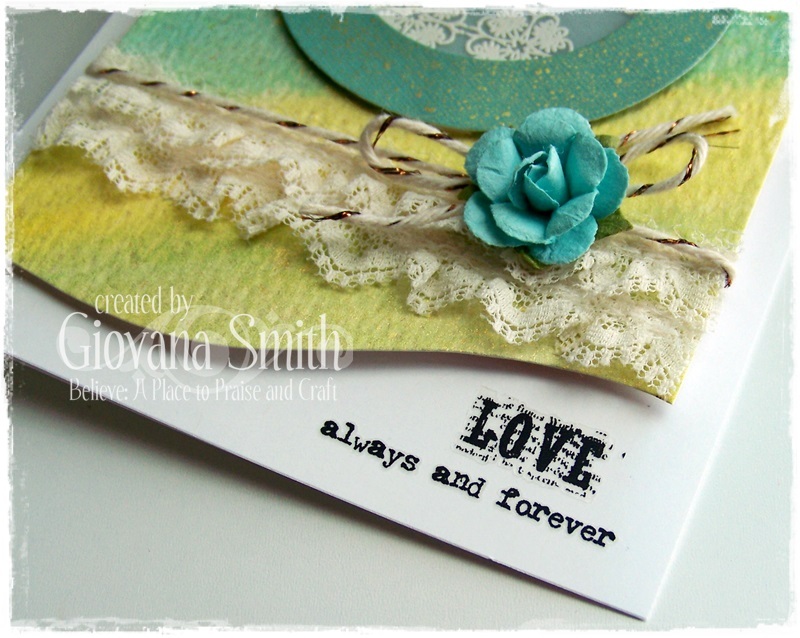 Add lace and copper shimmer twine, glue a blue Prima flower. Close-up of the embossed image, check out the pretty Sunflower Sparkle Mist. Love this card with the gorgeous colors and great way to use rub-ons. Love it. What a beautiful card! This may sound silly - I've never thought of using rub-ons on cards..... how daft is that?!? So beautiful!! I love the soft watercolored look!! Giovana, LOVE this Pretty card with your watercolor BG and the rub on! LOVE the lace and twine and flower, too! GORGEOUS!